Whip up this amazing batch of donuts for your friends to enjoy! All you need are tape cores and felt (or construction paper). 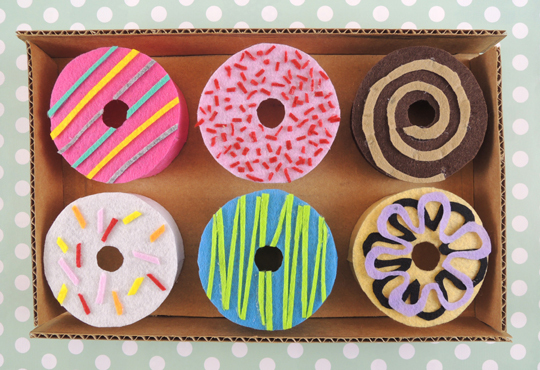 These beautifully crafted delectables were created by Marissa, whose love of donuts knows no bounds! We recommend reading Please, Mr. Panda by Steve Antony, (Scholastic, 2014). Mr. Panda has a box of tasty looking donuts to offer (and a cute little hat), but he very bluntly changes his mind every time a customer demands a donut. The problem? Everyone forgets to say “Please!” Finally a lemur utters the magic word and receives the entire box of donuts (and the hat)! To the politest, goes the prize. I love Marissa’s creativity and ingenuity…the “donut” is actually a masking tape core! 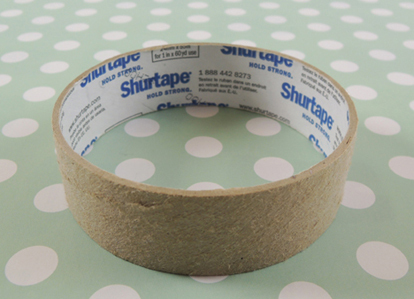 Wrap the outside of the tape core with felt and secure the felt in place with hot glue. 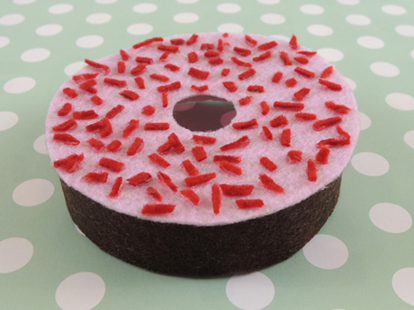 The top of the donut is a circle of stiffened felt. Marissa left the donut tops unattached so you can mix and match your donut styles. Genius. If felt isn’t your thing, construction paper works for this project too – and you can use tape instead of hot glue. 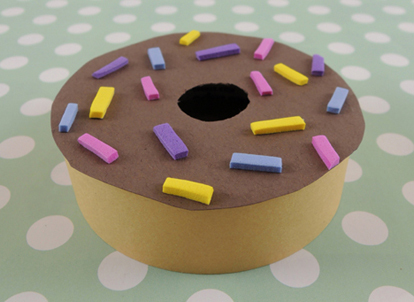 Here’s my construction paper donut with self-adhesive foam sprinkles to give it some texture (but construction paper sprinkles work just as well). Marissa crafted a custom cardboard box for her set of donuts and, best of all, made a cardboard panda hand to smack away greedy donut eaters. You can see the whole thing in action on her Instagram. You can also check out her fully stocked alphabet refrigerator, shadow puppets, bug sculptures, and 7 foot hand-crafted wall hanging. Girl is on FIRE! This entry was posted in Snap Story Times and tagged activity, art, children, craft, craft project, donuts, easy, how to, instructions, kids, library, literacy, manners, Mr. Panda, panda, Please, politeness, simple, Steve Antony, story time, story time project, storytime by Dana Sheridan. Bookmark the permalink.